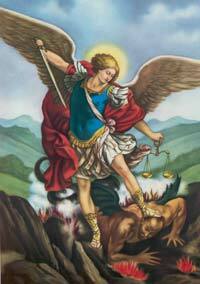 Saint Michael Prayer for the freedom of the Catholic Church in America! Religion- We will continue to say the Stations of the Cross during Lent. We are going to be practicing for the Mass that we will be in charge of on April 17. Writing: We will continue to journal and write a descriptive piece on a rainy day. Math: We will be adding two digit numbers to two digit numbers. Science: We will learn about push and pull forces. Tuesday: Math page 165/166 Wednesday: Study for spelling test! 2. Raise your hand for permission to speak! 3. Raise your hand for permission to leave your seat! 5. Keep your dear teacher happy! 1. Verbal warning to child. 2. If behavior continues, child moves his/her stick to the yellow circle and misses 5 minutes of recess. 3. If behavior continues, child moves his/her stick to the red circle. He/She will miss entire recess and a note will be sent home to parents.